After travelling for three weeks, I’m admittedly a bit in a fog now that I’m at back at home. I don’t know where to start, where to focus or what to do – I keep getting flashes of wildflife from the Galapagos, funny memories of hiking in the Ecuador rainforest and seeing the distinctive red brick of Manchester NH. So as I sit here on a Monday morning, trying to get myself focused on assignments that are due (and overdue) and story pitches for future publication, I desperately need to get myself into work mode. I couldn’t focus this am, and decided I needed to get outside and clear my head. 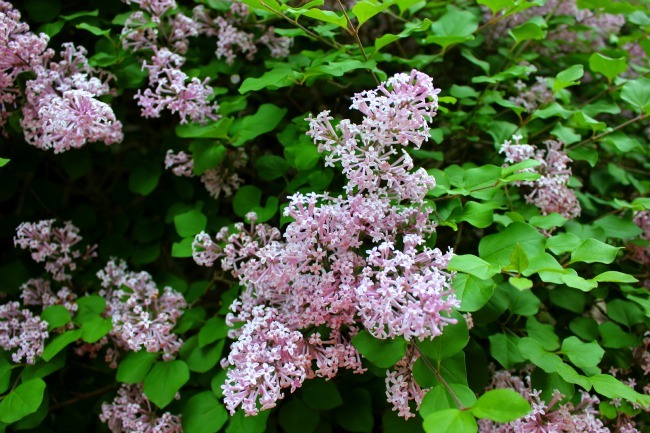 And thanks to the sweet scent of these lilacs, I was brought into the present. This huge bush is at the entrance of my condo building and thankfully due to a late start for many plants, I was home to benefit from the blooms. Even on a cool summer morning, with humidity lower than it has been, the freshness of the lilacs gave me a gentle welcome home and the encouragement to focus on what I need to do. As a side effect of travel, its not the worst thing to complain about – knowing you’ve gotten so focused while in your destination, you got into the local rhythm. And although its a disruption, and a mental challenge to get back on the writing track, I’m never not glad to jump this hurdle and get back into my work, and hopefully show more people what’s so great about our planet.